In the entire history of mankind there have only been a handful of notable statesmen who were vegetarians and seriously took a stand for animal rights. Even today there are very few. Slovenia is one of the few bright lights in the world of politics today. 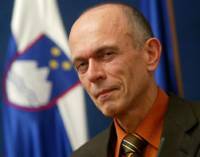 By giving this interview the president Dr Janez Drnovsek has for the first time expressed the message to people, to start thinking about the unimaginable brutality that man is inflicting upon animals. Because I feel vegetarian food is better, better quality. We eat meat because it's the way we had been brought up. I have been a vegetarian for a few years and just recently I have become a vegan, which means I don't eat milk, dairy products or eggs. There is still plenty of choice, varied vegetable foods, which are sufficient to our needs. I took this step following my inner feeling. Some people believe that vegan food is very limited and boring which is not true. It can be very diverse. I feel great - they say I have too much energy. On World protection of Animals Day (October 4) you invited members of Society for Liberation of Animals and their rights for discussions. What was discussed? I invited them mainly to try and convey the message to general public to coincide with this day. We don't always realise how we treat animals, how we manage them. They are live creatures. As I said people have this set idea of behaviour towards animals and as result very rarely question what we actually cause. If we think for a moment how man manages animals and what impact he has on animal world we could say he was not human at all. Just think of all slaughter houses and production of beef or poultry where conditions for animals are impossible. Animals are transported in lorries many times without any water which is extremly cruel. It is not that people are bad they just don't think about it. When the final product is in front of them on the plate they don't think what was it before and how it got to this stage. The ethics are part of the reason; the other part is the fact that humans don't need the animal flesh. It is only thinking patterns we follow that are ingrained in us. It is probably really hard to change overnight, but it can be done gradually. This is how I did it. I believe it is foolish, that European Union's main priority is one hundred percent subsidy of farming especially meat products. The fact that EU subsidises mass production of meat and poultry is really the main obstacle from the ethics point of view. Not only that but also from the point of view of nutrition. We are frequently reminded by nature i.e. mad cow disease, recently swine fever, bird flu. It is obvious that something is not as it should be, something is disturbing the natures balance and that should be a warning to us all. That is a factor as well although I believe the main reason to be awareness of people. It is a question of making people aware of what is happening and what are they being part of. I think that is the key. That in turn leads to changes in politics i.e. agricultural policy, farming subsidies and future directions. Instead of using huge resources for mass meat production we should use it for organic farming of diverse produce from cereals, pulses, fruit and all the products that originate from these. This would certainly be kinder to nature as organic production means no use of chemical fertilizers or additives. It would mean no pollution to the environment and no chemical additives in our food. We consume these chemicals every day in our food and they are harmful. But behind all this are the interests of big manufacturers, lobbies, huge profits which are the driving force for these food manufacturers' conglomerates. Nonetheless I believe that awareness of people continues to increase in our country and in EU. People are more and more searching for natural alternatives; they are turning to nature and becoming more aware of problems regarding animals and animal products. If I do it myself I can't see a reason why I wouldn't recommend it to others. I have no complaints as I said; I have more energy than I need. If nothing else I am living proof that you can survive without meat and meat products. How do you view the fact that we all have to pay the same national insurance contributions? It is well known that vegetarians are a lot healthier and therefore don't use the health service as frequently. This is a wider problem; the whole concept could be different. I don't think that is a valid point, because there should be some solidarity, where healthy people help those, who are unwell. It is true however that everyone is responsible for their own health. If we consumed less harmful and unhealthy food, we would considerably lessen the financial burden on our health service. Of course it is not in everybody's interest if that were to happen. What would happen to pharmaceutical industries, huge multinational companies which make billions from sick people? Hunting as killing animals in the name of sport is unethical. If you are referring to the part of the hunting organization that looks after nature environment and wild animals, for example helping with feeding in the winter – it is very useful. Hunting which is by definition just chasing and killing of animals is of course completely unethical. This is a well known dilemma which has recently been in forefront of politics in Europe, in Great Britain. You have to ask yourself would you like it if you were the subject of such testing. During the second world war my father was an inmate in the concentration camp in Dachau, where he was subjected to such medical experiments together with thousands other people. He didn't like it one bit. Some people would say it is necessary for the progress of science but I am sure that in most cases alternative methods can be used without the need for animal testing. It comes from low level of people's awareness. It is difficult to pinpoint the exact time in history. It is a question of respecting life in general. Animals are live creatures with feelings. Everyone who has a domestic animal or a pet knows that animals have feelings. The world's religions often speak about respecting life but they only mean human life and sometimes not even that. Looking back in the Middle Ages Catholics proclaimed for a long time that native Red Indians which were enslaved by the Spanish and Portuguese do not have a soul. This meant that they weren't treated as living creatures with feelings. Then they changed their mind and proclaimed that black people don't have souls. Centuries of black slavery followed. All this happened with the blessing of the Church. Today nobody accepts this anymore. We can see how historical conscience of people is changing despite the opposing views from some institutions at different points in time. It's nearly Christmas. For millions of people it is time for happiness, love and peace. For millions of animals it is a time of terrible cruelty at slaughter so that our tables can be laden with carcases. And all this to celebrate the birth of a man who loved animals, protected them and didn't kill them. What is your view on this? Fortunately people who say this don't decide who goes to hell and who doesn't. All the world leaders always emphasise their endeavours for world peace. Do you think peace is connected to our relationship to animals and nourishment of people without the need for killing? Tolstoy said "As long as there are slaughter houses there will be wars." If a person's conscience is highly developed they will not kill or be cruel to animals. You can not expect from such person to go to war and kill people for a profit. People who do not kill and eat animals have a greater chance of finding a way to live in peace in harmony. Everything is interconnected in one's conscience. On a higher level one comes with the other. Making people more aware is the key. How do world's politicians view this? The world's politicians are no more aware of this than most people. I have noticed that in many cases ordinary people are ahead of politicians. We see a lot of non governmental organizations championing causes that are not priorities of governments. Be it our treatment of animals, environment or climate change. This push for change is coming from ordinary members of society. When the critical mass of people accepts an idea, when majority of people expect and demand change only then will the politics respond. Sadly politicians are not the ones to encourage others to be conscious but instead they follow public opinion of the moment. When they see the public support slipping they reassess their priorities. Tolstoy is just one of many "great minds" of mankind, who publicly spoke for vegetarianism. Let me name a few: Pythagoras, Leonardo da Vinci, Nikola Tesla, Albert Einstein, and Mahatma Ghandi. These people are recognized for their great works and achievements, they are often quoted in recognition of their genius. Why do you think that mankind does not want to hear about animals and vegetarianism from these great people for example this daring saying from Albert Einstein "Nothing will increase our chances of survival on Earth as significantly as will switching to vegetarian food." How would you comment on this quote from the genius physicist? I think that people do love animals, their pets, but somehow they automatically eat other animals. If they had to slaughter a cow before they could have a steak, they would think twice. Meat products are so altered in appearance that people don't associate them with real animals. Again it's the question of consciousness of people. People often automatically accept the behavioural patterns without questioning them. Only when you question something, you can change your point of view and become more aware of what you are buying. From unofficial source I've heard that even your dog Brodi is vegetarian. Is it true?